Philadelphia-based travel company Highline designs group trips for the active traveler. Every planned adventure includes hiking and trail running through nature. Picture waking up in a teepee in the wilderness of California's Death Valley. You start your day with coffee and a home-cooked breakfast of shakshuka before heading out on a three-mile run with a handful of other travel pals, passing a waterfall as you jog through terrain overlooking colorful, mineral-rich mountains. The afternoon brings a sightseeing excursion by car and a five-mile hike through surrounding badlands. Steak and beer await next at a local joint, to be followed by a quick jaunt to the local hot springs, where you can gaze up at the Milky Way. If the idea of active vacationing trumps relaxing on the beach, you may want to check out Highline, a new Philadelphia travel company that creates boutique adventure trips. "The company is based on the idea and spirit of adventure and connecting with others outside of the digital world," says JT Kane, 41, who founded the company with his friend Ryan Callahan, 31. "There's a lot of digital burnout today, and we felt that there was a need for people to get outside and reconnect in a meaningful way. Part of that means not being glued to a screen 24/7." Highline travelers start the morning off with a five-mile run through Death Valley. Highline officially launched its first trip to Death Valley in March. 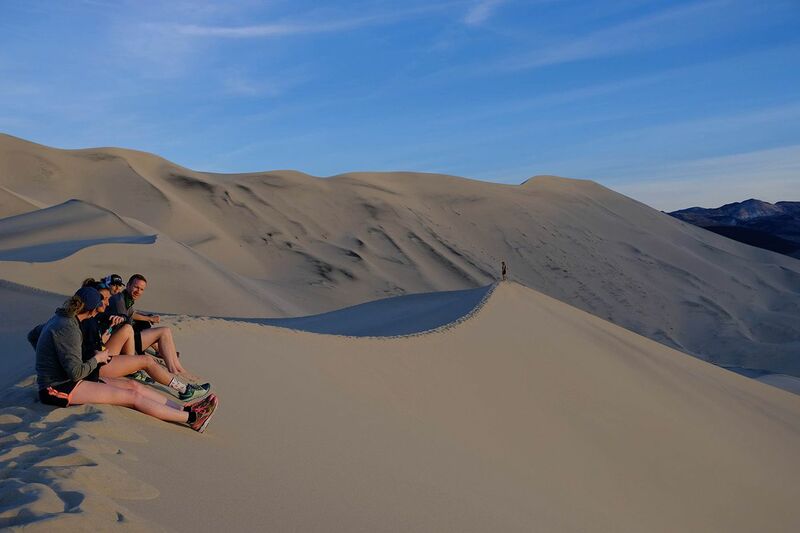 Among the mountains, slot canyons, salt flats, and dunes, Kane and Callahan led eight people on a six-day outing, featuring more than 25 miles of hiking and running. As with most Highline trips, cellphone service was rarely available, so ready or not, the only option was to unplug. "Our trips aren't created for the person who wants to go to an all-inclusive resort, but you don't need to be an ultra-runner to participate," says Callahan. In other words, you needn't go prepared to run 15 miles a day, but the trips aren't for those who want to lounge around at the beach all day with a margarita and iPhone in hand. Trail running is a daily part of each adventure. Morning routes are often three to five miles in length and allow participants to set their own pace. Most days also include an afternoon hike, and, depending on the trip, some will have a yoga class, too. The trips attract those of all fitness levels, and so far have drawn an age demographic ranging from mid-20s to mid-60s. "We climbed Old Rag, which ended up being the toughest and most rewarding hike of my life," says Marc Greisler, 59, who went on a Highline trip to the Shenandoah Valley in June. "There was this rock scramble at the top that was totally out of my comfort zone, but the experience made me excited to do something like it again." “We might push people’s limits a little bit, but the trips are designed to be accessible to a wide demographic,” says Highline cofounder JT Kane. As do many Highline travelers, Greisler signed up for the Shenandoah experience alone. It was his first such trip, which has since driven him to go on other group adventure journeys. "Everyone was out there to explore, so it was nice to be in a group of active people who enjoy doing the same thing that I like to do," says Greisler. "As a solo traveler, having experienced guides to lead the way was also really important to me, and the guys gave me the confidence I wouldn't have had on my own to push my limits." Highline caps attendance at a dozen or so people, striving to create an intimate experience that fuels social connection. Although the company is less than a year old, the limited-space trips are already selling out. "People want community — we're connected in this superficial social media way, but more and more, people are feeling like they don't really know each other very well," says Callahan. "People want to find that through experiences. We've reached the saturation point where no one really cares what the next iPhone is. People are looking to get back to something that's more authentic, and the place where that's most readily available is outside in nature." A group of travelers on Highline’s Shenandoah in June trip relax after a day of hiking. Highline caps attendance for each trip at a dozen people or so, striving to create intimate experiences that fuel social connection. This desire for unplugged, face-to-face connection and adventure appears to be driving a whole market of experiential group traveling options similar to Highline. In a general travel study released by Expedia at the start of this year, 74 percent of American respondents said they'd prefer to cash in on experiences rather than products. An increasing number of companies, both new — such as Living Big, catering to female travelers, and well-established, like Intrepid Travel, which recently launched a highly successful solo-traveler-only series — are tapping into the trend to make experiential vacationing easier than ever. Non-tour companies like Airbnb — with its new "Experiences" — are diving into the market, too, creating a pool of options that ranges wide and far. "We just want people to create good memories," says Callahan. "Whatever new technology you have at the moment, you're not going to remember it 10 years from now, but you will remember seeing a bear for the first time or hiking around Yellowstone and the people who you shared that experience with." Highline founders JT Kane (left) and Ryan Callahan scan a map of Death Valley, where they’ll lead guided trips several times throughout the next year. For 2018, Highline has two trips left with slots available. One will take Kane and Callahan back to guide the way through Death Valley. This time, however, the focus is on running the Death Valley Trail Marathon. Casual runners interested in exploring the area with Highline are better off waiting for the next trip there in March. In November, Highline will return to the Shenandoah Valley for a long weekend getaway designed to take in the fall foliage. Within the next two months, Highline plans to release its full 2019 calendar, expecting to host around five trips in total. Kane and Callahan are planning Highline's first adventure abroad, where guests will run and hike their way around the Dolomite mountains of northeastern Italy.